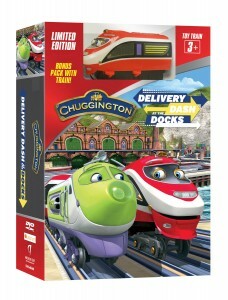 Chuggington DVD, “Delivery Dash at the Docks,” is coming down the tracks on February 23: Special Giveaway Opportunity! Chuggington DVD, “Delivery Dash at the Docks,” is coming down the tracks on February 23 Special Giveaway Opportunity! The latest Chuggington title from Anchor Bay Entertainment features six fun-fueled adventures from the popular Disney Junior TV series and stars two new characters, Daley and Skipper Stu! The DVD is also available with a special Daley collectible Toy Train from Tomy, making it the perfect addition to a young child’s Easter basket! Young fans will love the different episodes such as Delivery Dash at the Docks Special. There are also bonus features. I received a copy of this DVD and highly recommend for all young children! We have teamed up for a Giveaway! One winner will win a copy of the DVD! To enter, leave a comment below telling us your child’s favorite character from Chuggington! Deadline to enter is February 28th, 2016 at noon PST. One winner will randomly be selected via Random.org. US residents only, please. Self Disclosure: I received a free DVD to facilitate this post. No other compensation was received. In “Delivery Dash at the Docks,” Koko is thrilled to be spending the day training with Chuggington’s new express delivery engine, Daley. Together they pick up and deliver important packages all around Chuggington, frequenting the bustling docks where Skipper Stu, Chuggington’s new Dock Master, is loading and unloading the ship. Through their engaging adventures, Koko, Skipper Stu and all the Chuggers learn the importance of patience, paying careful attention to detail and teamwork! haven’t seen it yet but would love to watch with my kids! Oops! My email accidentally posted with an extra a .